Why the Tradiitonal Latin Mass? 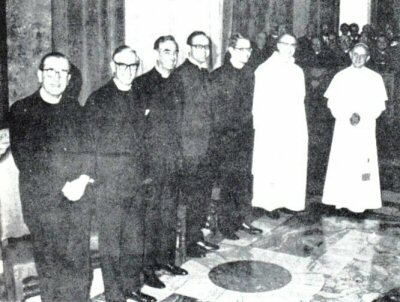 In 1969, Pope Paul VI issued a New Order of the Mass, the Novus Ordo Missae. Up to that time, what is commonly referred to as the "Tridentine" or "Latin" Mass, was used by the Church. On the face of things, it may seem to be a simple matter for the Pope to change the Mass. It has been done before. Is there a difference, then, between the modifications made by Paul VI and the liturgical changes of the past? There is a radical difference, and one that has had disastrous consequences for the universal Church. The "Tridentine" or Roman Rite Mass, while it has developed organically over the 2,000 year history of the Church, is essentially the Mass that was given to the Apostles and the Church by Our Lord Jesus Christ Himself. Although various rites emerged, they all maintained the same spirit imparted to the liturgy by Our Lord and were only adapted to various cultures without any deviation in doctrine. The Roman Rite, up to Vatican II, underwent only minor changes, such that the famous English liturgist Fr. Adrian Fortescue was able to state that "no one has ventured to touch it except in unimportant details." "We specifically command each and every patriarch, administrator, and all other persons or whatever ecclesiastical dignity they may be, be they even cardinals of the Holy Roman Church, or possessed of any other rank or pre-eminence, and We order them in virtue of holy obedience to chant or to read the Mass according to the rite and manner and norm herewith laid down by Us and, hereafter, to discontinue and completely discard all other rubrics and rites of other missals, however ancient, which they have customarily followed; and they must not in celebrating Mass presume to introduce any ceremonies or recite any prayers other than those contained in this Missal. "Furthermore, by these presents [this law], in virtue of Our Apostolic authority, We grant and concede in perpetuity that, for the chanting or reading of the Mass in any church whatsoever, this Missal is hereafter to be followed absolutely, without any scruple of conscience or fear of incurring any penalty, judgment, or censure, and may freely and lawfully be used. Nor are superiors, administrators, canons, chaplains, and other secular priests, or religious, of whatever title designated, obliged to celebrate the Mass otherwise than as enjoined by Us. We likewise declare and ordain . . . that this present document cannot be revoked or modified, but remain always valid and retain its full force . . . [The complete Apostolic Constitution "Quo Primum" of Pope St. Pius V (July 14, 1570) is available in print from Angelus Press or online]. 1. The accompanying critical study of the Novus Ordo Missae, the work of a group of theologians, liturgists and pastors of souls, shows quite clearly in spite of its brevity that if we consider the innovations implied or taken for granted which may of course be evaluated in different ways, the Novus Ordo represents, both as a whole and in its details, a striking departure from the Catholic theology of the Mass as it was formulated in Session XXII of the Council of Trent. The "canons" of the rite definitively fixed at that time provided an insurmountable barrier to any heresy directed against the integrity of the Mystery . . . ("The Ottaviani Intervention – Short Critical Study of the New Order of Mass" is available from TAN Books or online). Vatican I in 1870 defined the Pope to be, not an absolute monarch, but the guarantor of obedience to the revealed word. The legitimacy of his power was bound up above all with his transmitting the Faith. This fidelity to the deposit of the Faith and to its transmission concerns in a quite special way the liturgy. No authority can ‘fabricate' a liturgy. The Pope himself is only the humble servant of its homogenous development, its integrity, and the permanence of its identity." The Pope, as the guardian of the Deposit of Faith, has a duty to preserve the liturgy intact and pass it on essentially unmodified to the next generation. The very authors of Vatican II, on the other hand, openly acknowledged their desire not to pass on Tradition, but to make it. St. Vincent of Lerins in the 5th century gave as a standard for the orthodoxy of doctrine that which has been believed everywhere (ubique), always (semper), and by all (omnia). But, as Cardinal Ratzinger points out, the Council Fathers of Vatican II rejected this hallowed definition: "Vatican II's refusal of the proposal to adopt the text of Lerins, familiar to, and, as it were, sanctified by two Church Councils, shows once more how Trent and Vatican I were left behind, how their texts were continually reinterpreted... Vatican II had a new idea of how historical identity and continuity were to be brought about." This new idea was nothing other than to create a pseudo-tradition from the "common consciousness" of the Council Fathers. This is pure Modernism and totally contrary to the Deposit of Faith. The Church has always set forth the firm and clear principle that: "The way we worship is the way we believe." The doctrinal truths of the Faith are embodied in the worship we offer to God. In other words, it is the Holy Sacrifice of the Mass that teaches us our theology and not the reverse. The True Mass comprises the Apostolic Tradition of faith and morals in its very essence. Every doctrine essential to the Faith is taught therein. Pope Leo XIII points out in Apostolicae Curae that the Church's enemies have always understood this principle as "They knew only too well the intimate bond that unites faith with worship, the law of belief with the law of prayer, and so, under the pretext of restoring the order of the liturgy to its primitive form, they corrupted it in many respects to adapt it to the errors of the Innovators." It is no wonder, then, that Luther coined the slogan: "Take away the Mass, destroy the Church." St. Alphonsus Liguori (Bishop, Doctor of the Church and Patron of Theologians) explains that "The devil has always attempted, by means of the heretics, to deprive the world of the Mass, making them precursors of the Anti-Christ, who, before anything else, will try to abolish and will actually abolish the Holy Sacrament of the altar, as a punishment for the sins of men, according to the prediction of Daniel: ‘And strength was given him against the continual sacrifice' (Dan. 8:12)." who collaborated in making up the New Mass! The question then becomes: Does the New Mass teach the Catholic Faith? No, say both Cardinals Ottaviani and Bacci: "It is clear that the Novus Ordo no longer intends to present the Faith as taught by the Council of Trent." Pope St. Leo the Great (Father and Doctor of the Church) instructs us: "Teach nothing new, but implant in the hearts of everyone those things which the fathers of venerable memory taught with a uniform preaching ... Whence, we preach nothing except what we have received from our forefathers. In all things, therefore, both in the rule of faith in the observance of discipline, let the pattern of antiquity be observed." How well founded, then, were the concerns expressed by Pope Pius XII shortly before the introduction of the New Mass: "I am worried by the Blessed Virgin's messages to Lucy at Fatima. This persistence of Mary about the dangers which menace the Church is a divine warning against the suicide that would be represented by the alteration of the Faith in Her liturgy." Common Penitential Rite: The traditional Mass begins with the priest reciting personal prayers of reparation to God called "The Prayers at the Foot of the Altar." The New Mass begins instead with a "Penitential Rite" which the priest and people recite together. Who were the first to introduce a common penitential rite? The 16th century Protestants, who wanted to promote their teaching that the priest is no different from the layman. The Offertory: The Offertory prayers of the traditional Mass clearly express a number of Catholic teachings, as that the Mass is offered to God to satisfy for sin and that the saints are to be honored. The Protestants rejected these teachings and so abolished the Offertory prayers. "That abomination called the Offertory," said Luther, "and from this point almost everything stinks of oblation!" In the New Mass as well, the Offertory is gone – it has been replaced with a ceremony called "The Preparation of the Gifts." The prayers "offensive" to Protestants have also been removed. In their place is the prayer "Blessed are you, Lord God of all creation," based on a Jewish grace before meals. The "Eucharistic Prayer": The traditional Mass has only one "Eucharistic Prayer," the ancient Roman Canon. The Canon was always a favorite target of Lutheran and other Protestant attacks. Instead of just one Canon, the New Mass now has a number of "Eucharistic Prayers," only one of which we will mention here. Eucharistic Prayer No. 1 is an "edited" version of the Roman Canon. The lists of Catholic saints, so despised by Protestants, are now optional, and hence rarely used. The translators did some further "editing." Among other things, the idea that Christ the Victim is offered at Mass (a notion Luther condemned) has disappeared. All the Eucharistic Prayers now incorporate some typical Protestant practice. They are recited in a loud voice instead of silently, and they have an "Institution Narrative," instead of a Consecration. (According to Protestant beliefs, their ministers do not consecrate the Eucharist like Catholic priests do; they just narrate the story of the Last Supper.) Even Christ’s own words in the Consecration were altered: ". . . Which shall be shed for you and for many, unto the remission of sins" was changed to ". . . It will be shed for you and for all men so that sins may be forgiven." (Rome acknowledged this "mistranslation" recently.) The various signs of respect toward Our Lord present in the Blessed Sacrament (genuflections, signs of the cross, bells, incense, etc.) have been reduced, made optional, or eliminated. Veneration of the Saints: The prayers of the traditional Mass frequently invoke the saints by name and beg their intercession. The Church's veneration of the saints in her worship was another practice which Protestants dismissed as "superstition." The New Order of the Mass dropped most invocations of the saints by name, or made them optional. In the new Missal, moreover, the weekday prayers for saints' feast days (most of which are also optional) have been rewritten for the benefit of Protestants – allusions to miracles, the defense of the Catholic Faith, or to the Catholic Church as the one, true Church have disappeared. False Translations: Lastly, there is the matter of the false official English translations of the New Mass. A whole book could be written on the errors and distortions they contain. Here we will mention briefly only the official translations of the prayers for the 34 "Sundays in Ordinary Time." The following are some of the ideas which the English translation suppresses: God's wrath, our unworthiness, error, sins which "burden our consciences," God's majesty, obedience to His commandments, supplication, humility, eternity, heaven – many more could be listed. Perhaps the most serious omission is the word "grace." It appears 11 times in the Latin original. It does not appear even once in the official English "translation"! Clearly, then, the "new liturgy reflects a new ecclesiology, whereas the old reflects another ecclesiology" (Cardinal Benelli) and one quite foreign to the Catholic Church. This ultimately means as Fr. Gelineau, S.J., one of the "experts" who co-authored the New Mass, pointed out, that "The New Mass is a different liturgy. This needs to be said without ambiguity. The Roman Rite, as we knew it, no longer exists. It has been destroyed." The Catechism of the Council of Trent tells us that "a Catholic sins against the Faith by participating in non-Catholic worship." The New Mass is not Catholic worship, even if it has retained the name "Catholic," as did the Anglican liturgy until recently. "By their fruits you shall know them. Do men gather grapes of thorns, or figs of thistles? Even so every good tree bringeth forth good fruit, and the evil tree bringeth forth evil fruit. A good tree cannot bring forth evil fruit, neither can an evil tree bring forth good fruit" (Matt. 7:15-17). Given the foregoing, it should be plain that the New Mass was conceived for an evil purpose and constructed by evil means. It only follows that such a tree would have disastrous effects on the Church. Let us look at its fruits as reported in Index of Leading Catholic Indicators: The Church Since Vatican II by Kenneth Jones. Priests. While the number of priests in the United States more than doubled to 58,000, between 1930 and 1965, since then that number has fallen to 45,000. By 2020, there will be only 31,000 priests left, and more than half of these priests will be over 70. Ordinations. In 1965, 1,575 new priests were ordained in the United States. In 2002, the number was 450. In 1965, only 1 percent of U.S. parishes were without a priest. Today, there are 3,000 priestless parishes, 15 percent of all U.S. parishes. Seminarians. Between 1965 and 2002, the number of seminarians dropped from 49,000 to 4,700, a decline of over 90 percent. Two-thirds of the 600 seminaries that were operating in 1965 have now closed. Sisters. In 1965, there were 180,000 Catholic nuns. By 2002, that had fallen to 75,000 and the average age of a Catholic nun is today 68. In 1965, there were 104,000 teaching nuns. Today, there are 8,200, a decline of 94 percent since the end of Vatican II. Religious Orders. For religious orders in America, the end is in sight. In 1965, 3,559 young men were studying to become Jesuit priests. In 2000, the figure was 389. With the Christian Brothers, the situation is even more dire. Their number has shrunk by two-thirds, with the number of seminarians falling 99 percent. In 1965, there were 912 seminarians in the Christian Brothers. In 2000, there were only seven. The number of young men studying to become Franciscan and Redemptorist priests fell from 3,379 in 1965 to 84 in 2000. Catholic schools. Almost half of all Catholic high schools in the United States have closed since 1965. The student population has fallen from 700,000 to 386,000. Parochial schools suffered an even greater decline. Some 4,000 have disappeared, and the number of pupils attending has fallen below 2 million – from 4.5 million. Catholic Marriage. Catholic marriages have fallen in number by one-third since 1965, while the annual number of annulments has soared from 338 in 1968 to 50,000 in 2002. Attendance at Mass. A 1958 Gallup Poll reported that three in four Catholics attended church on Sundays. A recent study by the University of Notre Dame found that only one in four now attend. Only 10 percent of lay religious teachers now accept church teaching on contraception. Fifty-three percent believe a Catholic can have an abortion and remain a good Catholic. Sixty-five percent believe that Catholics may divorce and remarry. Seventy-seven percent believe one can be a good Catholic without going to mass on Sundays. By one New York Times poll, 70 percent of all Catholics in the age group 18 to 44 believe the Eucharist is merely a "symbolic reminder" of Jesus. Who could possibly claim that there is not a terrible crisis of faith in the Catholic Church!? It is no wonder that Cardinal Ratzinger affirmed: "I am convinced that the ecclesial crisis in which we find ourselves today depends in great part on the collapse of the liturgy." It is clear how the New Mass could create such a disaster. Liturgy dictates belief. A protestantized liturgy yields heretical belief, loss of the Faith, and devaluation of the priesthood. Satan has been able to accomplish more effective damage to the entire body of the Church in the past 35 years through the destruction of the Mass than ever before. The New Mass is condemned by its own nature and by its fruits. The crisis in the Church will continue to worsen until we return to orthodoxy and discipline. What is a Catholic to do in such troublesome times? He must follow the advice of St. Vincent of Lerins: "What then shall the Catholic do if some portion of the Church detaches itself from communion of the universal Faith? If some new contagion attempts to poison, no longer a small part of the Church, but the whole Church at once, then his great concern will be to attach himself to antiquity (Tradition) which can no longer be led astray by any lying novelty." St. Athanasius, one of the four great Doctors of the Eastern Church, earned the title of "Father of Orthodoxy" for his strong and uncompromising defense of our Catholic Faith against the Arian Heresy which affected most of the hierarchy, including the pope. Athanasius was banned from his diocese at least five times, spending a total of seventeen years in exile. He sent the following letter to his flock which is a powerful lesson for our times: "What saddens you is the fact that others have occupied the churches by violence, while during this time you are on the outside. It is a fact that they have the premises – but you have the Apostolic Faith. They can occupy our churches, but they are outside the true Faith. You remain outside the places of worship, but the Faith dwells within you. Let us consider: what is more important? The place or the Faith? The true Faith, obviously. Who has lost and who has won in this struggle? The one who keeps the premises or the one who keeps the Faith?" Please pray that our dear Savior will grant to our holy Father the Pope and the bishops of the Church the grace to abolish the protestanized New Mass and return to the exclusive use of the Traditional Latin Mass. The disastrous results and the loss of faith due to Vatican II and the New Mass are obvious. We should avoid the New Mass at all cost and attend only the Traditional Latin Mass. For help locating the Traditional Latin Mass in your area, send us an email or call us at 502-425-9738.